Sicilian Rice Casserole, all the flavors of arancini (rice balls) but without the fuss and frying! 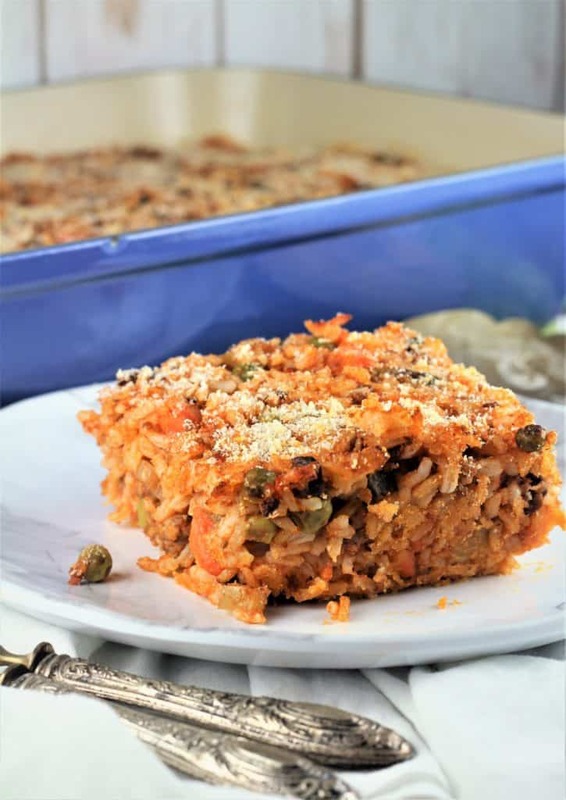 I’m so happy that I can now enjoy this Sicilian Rice Casserole! That’s because for years I was allergic to peas. Just omit the peas you say? Yes, but it just wouldn’t be the same without them. My mother made this dish without the peas for so long, I now have to remind her to reintroduce them. If you love arancini like I do, then you’ll love this dish. It’s just like eating arancini but in the form of a casserole. You have all the flavors but without the frying. Don’t get me wrong, I prefer my arancini any day but sometimes you want a simplified version without all the fuss. The steps involved are the same as for preparing arancini. I begin by making a meat sauce. What’s different about this sauce is the addition of mushrooms, which my mother also adds in her sauce for arancini. They are optional but the mushrooms definitely a wonderful earthy flavor to the sauce. Sauté onions, garlic, carrots, celery and mushrooms. Next add the ground meat trio (beef, pork, veal) and cook until no longer pink. Pour in white wine and cook until it evaporates. Add the tomato sauce and cook until thickened, about 30 minutes. Stir in peas and cook for 15 minutes longer. Meanwhile, cook 2 cups of rice. When done, transfer to a large mixing bowl and stir in 1 tbsp butter. Add the meat sauce, 1/2 cup combined Parmigiano/Pecorino romano cheeses and stir. Prepare a rectangular casserole by buttering the bottom and sides and sprinkle with breadcrumbs. Pour in the rice mixture, top with more breadcrumbs and grated cheese. Bake at 350F for 20 minutes, then broil for 2-3 minutes until the top is golden. Let stand for about 15 minutes before serving. This casserole can be prepared ahead of time. 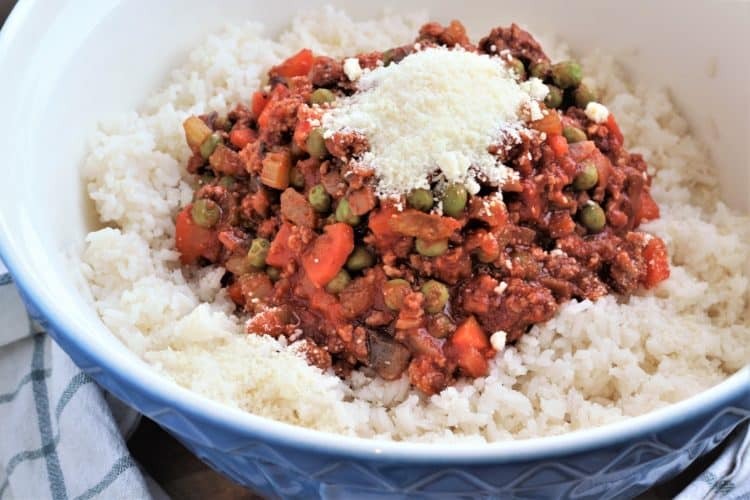 You can either cook the rice and meat sauce the day before and assemble and bake the day you’re serving it. Alternately, assemble the entire casserole the day before and simply bake before serving. You can also freeze the casserole unbaked. Thaw by placing in the freezer the night before serving and bake for an extra 15-20 minutes. If the top becomes too dark or crispy, simply cover with foil until it is warmed through. 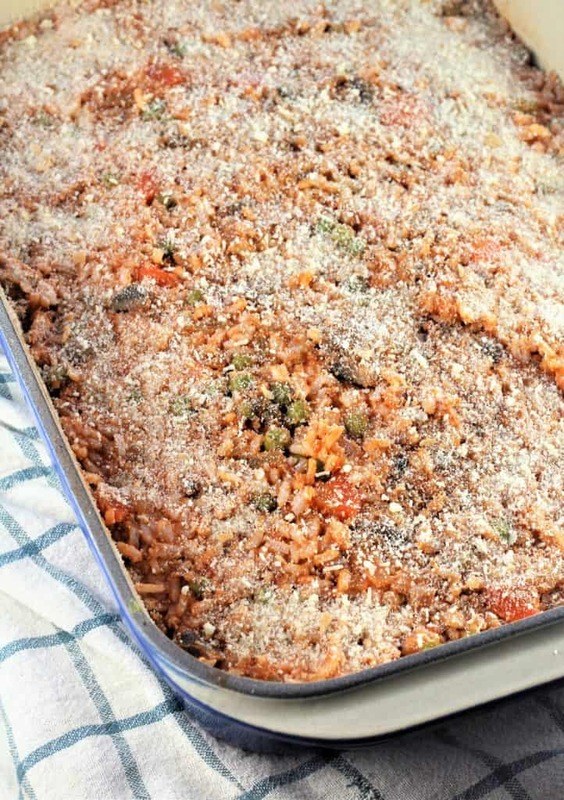 If you love your casserole extra cheesy, stir grated or cubed mozzarella into the rice mixture. I made this casserole for dinner this week and my kids told me that it smelled like arancini in the house. GIve it a try and I’m sure you’ll agree! 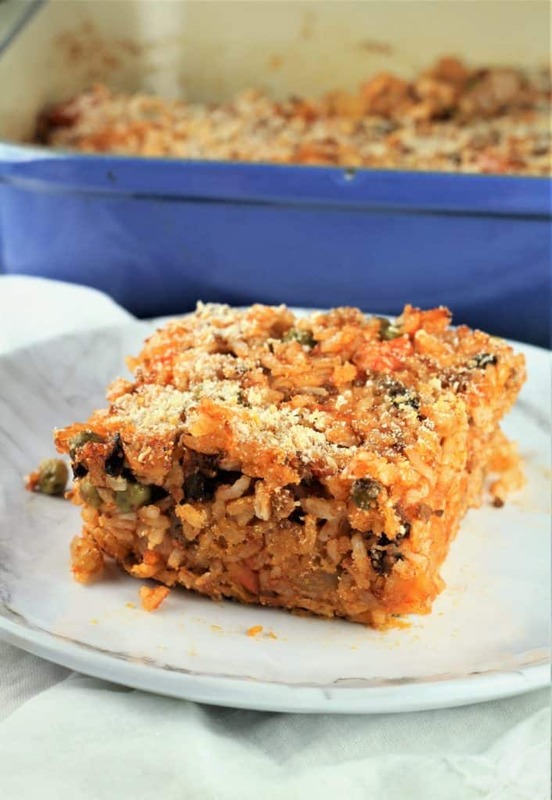 Please send me your photos of your Sicilian Rice casserole by tagging me with @mangiabedda or #mangiabedda on Facebook or Instagram. Don’t forget to Pin the recipe as well! Buon appetito! Sicilian Rice Casserole, all the flavors of arancini (rice balls) but without the fuss and the frying! Heat the olive oil in a large sauce pan. Sauté onions, garlic, carrots, celery and mushrooms for about 5 minutes. Add salt and pepper. Add the wine and cook stirring until it has evaporated, about 2 minutes. 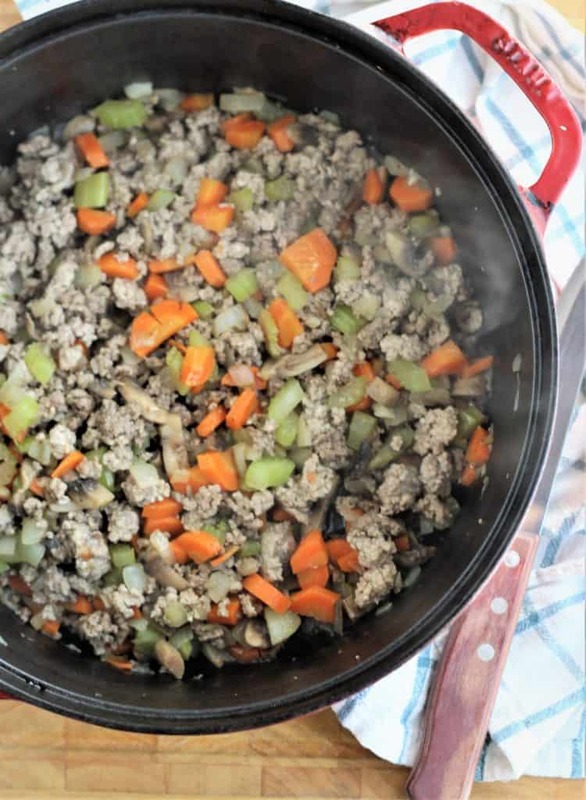 Add the ground meat and cook stirring to break up the pieces until no longer pink. Pour in the tomato passata, lower to a simmer and cook for 30 minutes with the lid loosely covering the pan. After 30 minutes add the peas and continue cooking for 15 minutes longer. Adjust the seasoning as needed. While the sauce is simmering, bring 4 cups of water to a boil in a medium sized sauce pan. Add salt, rice and cook covered for 15 minutes. Remove from heat and let sit covered for 5 minutes longer. Transfer to a large mixing bowl and stir in the butter. Preheat oven to 350F. Butter a 10"x14'"rectangular casserole and coat with 2 tbsp breadcrumbs. In a large mixing bowl combine rice, sauce and 1/2 cup Parmigiano/pecorino cheese. Stir to combine. Place the rice mixture in the prepared casserole and spread out evenly. Top with remaining 2 tbsp breadcrumbs and 1 tbsp Parmigiano/pecorino cheese. Bake for 20 minutes. Preheat broiler and bake 3 minutes longer until lightly browned on top. Let sit 15 minutes before serving. This casserole can be prepared ahead of time. 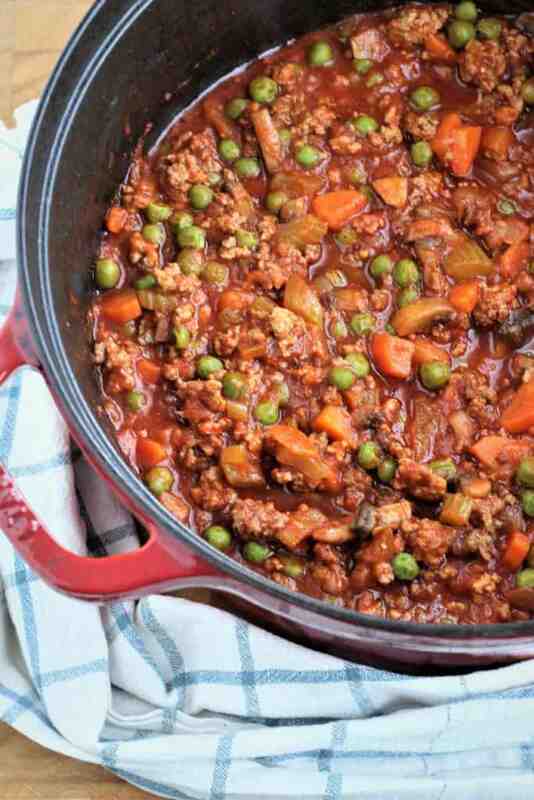 You can either cook the rice and meat sauce the day before and assemble and bake the day you're serving it. Please note that the nutritional information is approximate and may vary according to exact portion size and ingredients used. Made it and was delicious! By the way, my maiden name is Mangiapane, lol. I’m so glad you enjoyed it, thanks for letting me know. And by the way, love the last name! OMG!!! Can't wait to try your recipe. My mother in law's version we call Rizzo al Forno is a family favourite. Have meant to sit down with her and write down her recipes but have yet to do so. Will keep you posted on how it turns out for me. Thanks Lora! I strongly recommend you take the time to write down those recipes, you’ll never regret it. Please do let me know and thank you for your comment! Looks really good! Going to make as my husband loves Italian good and also rice! (Win win right?) Not a mushroom fan so will leave those out- will this be alright? Thanks for sharing this!! Thank you Alice! Yes you can definitely omit the mushrooms. Those are my mom’s addition but you can definitely personalize this dish as you please. Hope you enjoy it and thanks for stopping by my blog! 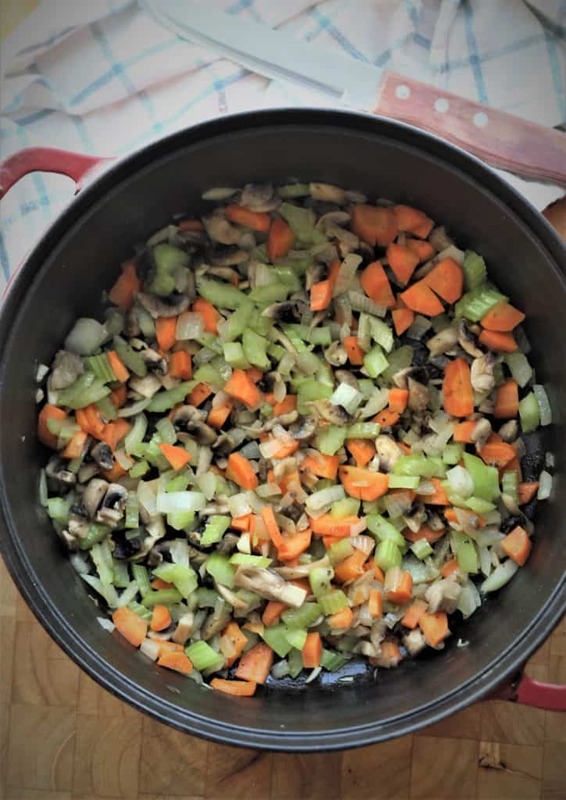 Nadia, I especially appreciate this recipe since my son, who is developmentally disabled, is particularly fond of rice and I am always looking for new ways to make and serve it. I will definitely give this a try and know it will be received with great smiles. This is very similar to a macheroni bake I make, using elbows, and always add mozzarella. I just never even thought of replacing the mach with rice. Even at 82, I am learning new things all the time! Hi Anna, I do hope he enjoys it. If he likes mozzarella I suggest you add cubed pieces of it in the rice mixture. That way when he bites into it he'll have those lovely ooey, gooey stringy pieces! We are all learning all the time dear Anna! Thanks for your comment and do let me know how it goes! I can't wait to make this!!!! Thanks Annie, it’s a good one! Very similar flavours as in arancini but faster and without the frying!